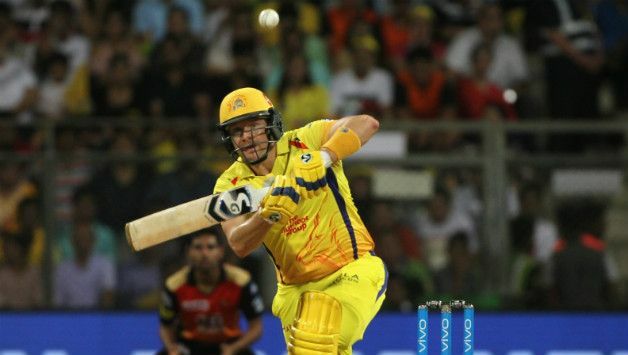 Shane Watson’s stunning knock helped Chennai Super Kings in securing 2018 Indian Premier League (IPL) title with an eight-wicket win over Sunrises Hyderabad in Mumbai on Sunday. The day started with Chennai captain MS Dhoni winning the toss and opting to field first. His decision proved a correct one as Hyderabad lost wicketkeeper-batsman Shreevats Goswami early. A 51-run partnership for the second-wicket between Shikhar Dhawan and Kane Williamson stabilize the ship, but even then, Hyderabad never get going and kept losing wickets at regular intervals and were eventually restricted to 178 for six in their allotted 20 overs. Captain Williamson finished the innings with the top score of 47 off 36 balls with the help of five fours and two sixes. He was well supported by veteran middle-order batsman Yousuf Pathan, who scored 45 off 25 balls with the help of four fours and two sixes. For Chennai, pacers Lungi Ngidi, Shardul Thakur, Dwayne Bravo and spinners Karn Sharma and Ravindra Jadeja claimed a wicket each. In reply, Chennai had a poor start as they lost last match hero Faf du Plessis at the score of 16 in the fourth over. But from there on, it was all Watson show who scored a stunning century, fifth century in the T20 format and fourth in IPL history to take his team over the line in the 19th over at the expense of just two wickets. Former Australia all-rounder remained unbeaten on 117 off 57 balls with the help of 11 fours and eight sixes. He was well-supported by veteran middle-order batsman Suresh Raina, who scored 32 off 25 balls with the help of three fours and one six. For Hyderabad, pacer Sandeep Sharma and Carlos Brathwaite claimed a wicket each. For his outstanding batting performance, Watson was named player of the match.